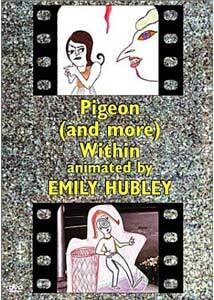 Pigeon (and more) Within, represents a compilation of 7 short, animated projects by artist Emily Hubley. Hubley has been a steady personality in the realm of animation, doing her own pieces and gallery work since the late 1970s. Often surreal and philosophical, her shorts feature narration that tells a story of some sort, in some form. While this disc is not a complete representation of her entire career, it is probably a selective collection that represents some of the her best work. While I've seen Hubley's work imitated over and over, there's a certain dignity to her own projects that never really emerges from those other films. Her subjects are often of a semi-personal nature, or an examination of feelings of isolation or loss. Despite such heavy concepts, Hubley (who typically narrates herself) still manages to keep a certain sense of humor. One of her most recent projects was contributing to the film Hedwig and the Angry Inch which, for obvious reasons, is not included here. There is little else to say about these subtle, simple looks at life through Emily Hubley's eyes. They stand very much on their own, in a realm that seems very separate from most film and animation. I don't mean that so much as amazingly high praise as much as a reflection of how well Hubley has made these shorts her own. Some artists really put their own stamp on their projects, and these truly bear that mark of her strong personality. Image Transfer Review: While digital problems are non-existent here, the source varies in quality, depending largely on the age of the short. The older shorts show heavy signs of dirt, speckles and heavy grain. The artistic technique often uses old photographs and other things, which obviously appear to have an effect on the image quality, but is intentional. Overall, the high bit-rate transfer, and apparent low-compression lead to an image that feels extremely faithful to its source, without any vagrant artifacts or sharpening problems popping up. The black level is gray to a certain extent, but this seems rooted, again, in the general quality of the original material. Audio Transfer Review: The shorts use a mono audio track that's presented as a Dolby Surround track. A few of the films have some limitations with the clarity of the narration, but it's fairly minor. Most tracks sound very good, despite the fact that the musical score isn't in stereo. There are no serious problems, but I think ultimately a single channel mix would have sounded better. Extras Review: There are no supplemental features, just a menu with direct access to the films. Each short has its own chapter stop, with the exception of Blake Ball, which runs at about 16 minutes, is divided into 10 chapters. For those who are long-time followers of Emily Hubley's work, this DVD is pretty much a no-brainer to pick up. What I think would be interesting, though, would be to see many of these shorts slightly re-imagined with new, more active sound mixes and possibly increased quality on the video side of things.